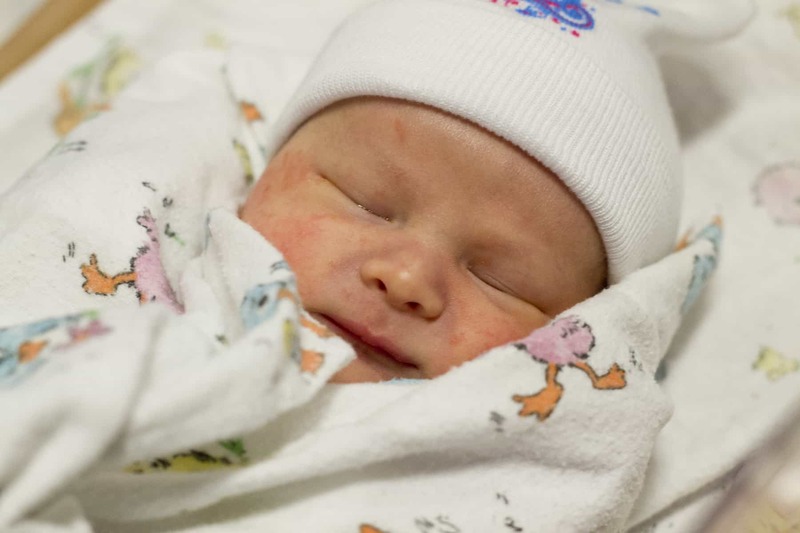 Saint Francis Medical Center celebrated the delivery of Cape Girardeau’s first baby of 2016. At 12:31 am on Friday, January 1, 2016, a baby boy was welcomed into the world by proud parents Michaela Dean and Zech Bardezbain of Patterson, Mo., and caring Family BirthPlace nursing staff. Grant D. McWilliams, DO, FACOG, obstetrician/gynecologist at Cape Care for Women, delivered 7-pound, 5-ounce, 20.25-inch Hadley Lee Hunter. To further welcome the new arrival, the Medical Center presented the family with a special basket of baby items. The Family BirthPlace saw many unique names throughout 2015, but some names appeared more often than others. For girls born at Saint Francis in 2015, the most popular name was Zoey; and for boys, Elijah. These names were followed closely by Abigail, Ella, Madeline and Harper for girls, and Carson, Colton, Liam and Oliver for boys. Unique names on the list for 2015 were Adeline, Birdie, Freya, Jett and Lilith for girls and Atticus, Beckett, Felix, Jules and Silas for boys. Consistent with national trends, many local babies born in 2015 were named after celebrities, namely Khloe (Kardashian), Zoey (Deschanel), Channing (Tatum), Harrison (Ford), Kiera (Knightley) and Blue Ivy (Carter, daughter of Jay Z and Beyoncé). Royalty also had an influence on names for boys and girls, from the British family (Kate, Katherine, Charles, Charlotte and William) to titles (Kaiser and Prince) and outcomes (Tieranie). Another popular trend was nature-based names like Ember, Nova, Raven, Stella, Summer and Willow for girls and Everest, Phoenix, River and Talyn for boys. Irish names were a popular choice this year for both boys and girls, including Aiden, Declan, Erin, Finley/Finn/Finnian, Gavin, Ian, Isla, Kiera, Liam, Nolan, Nora, Owen, Quinn and Rory. Old-fashioned names are again on their way up, with Aurora, Caroline, Cecelia, Eleanor, Grace, Hazel, Lillian, Penelope and Vera all on the list for girls in 2015, and Alexander, Emmett, Henry, James, Joel, Milo, Rodney and Zeke on the boys’ list. For boys, firearms seemed to be another trend, with names like Colt, Gauge, Garrison, Sterling and Winchester appearing on the list. Fittingly, there was one baby Francis born at Saint Francis in 2015. The Family BirthPlace ended the year with 881 deliveries, including 13 sets of twins – six sets in August alone!